And this year Hans Hartwig Ruthenberg Graduate Award goes to …. Beatrice Nöldeke, Bezawit Adugna Bahru and Lutz-Heiner. Beatrice from Leibniz University of Hanover conducted a research in Zambia on “Gender-Specific Aspects of Transforming Fish Value Chains in Zambia”. She found that better food security can be guaranteed by empowering females in fish value chains. The second recipient, Bezawit from University of Hohenheim researched “Climatic shocks and child undernutrition in Ethiopia: a longitudinal path analysis’’. She observed that program targeted at climate affected areas have a positive effect on the livelihood and nutrition of households especially the children. The third awardee, Lutz-Heiner Otto from University of Hohenheim, researched on “Assessment of the economic potential and land-use changes of conservation agriculture practices in northern Namibia - a multiperiod modelling approach”. He developed a computer model to simulate real-life farming activities in Namibia and to assess the income potential of conservation agriculture (CA). It is quite interesting that CA has a huge potential to improve the economic potential of smallholder farmers. Each awardee received a cash prize for their outstanding research on the critical problems facing food security in the developing countries. 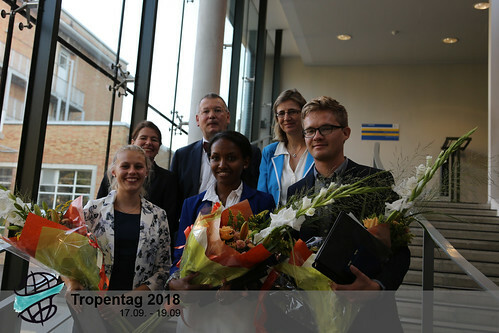 A big congratulations from Tropentag team!